This is an extremely tasty and easy dish to prepare. 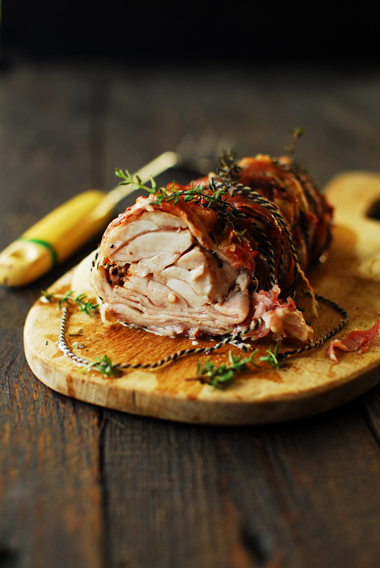 The rabbit fillet is wrapped in pancetta for extra flavor. The meat is tender and juicy and above all super garlicky:) Who doesn’t love that? Serve with roasted potatoes and veggies. Yum! Preheat the oven to 180°C. Flatten the garlic cloves with a knife, without peeling them. Place on a baking sheet, sprinkle with 1 tablespoon of olive oil and put in the oven for 15 minutes. Now peel the garlic, put into a foodprocessor, add 1 tablespoon of olive oil and blend. Spread the slices pancetta on a roasting pan and place the rabbit pieces on top. Add the garlic and sprinkle with salt, pepper, thyme and paprika. 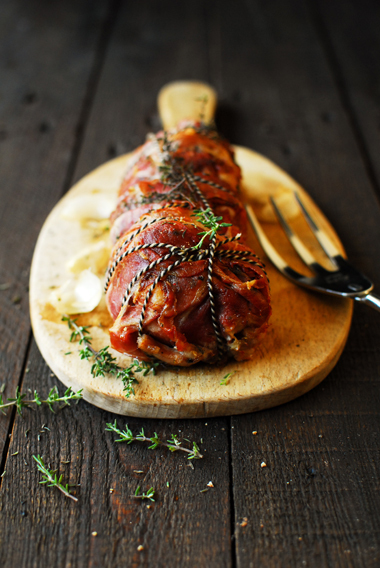 Roll the pancetta over the stuffing and tie up with butcher’s twine. Lightly brush the top with olive oil and transfer the roasting pan to the oven for 35 minutes. Enjoy! I just found your blog today—It is absolutely wonderful!!! Bravo for all your unique recipes! Thanks for your kind words:) Merry Christmas!